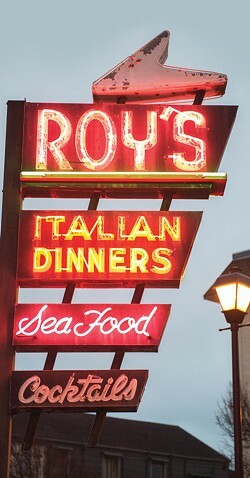 A little after 5 p.m. on Saturday, the sky over Old Town Eureka is dark enough for the neon sign in front of Roy's Club Italian Restaurant to cast pink light on a party of four ambling toward the door. They smile and tilt their heads at one another on the sidewalk. "Well, here we go." 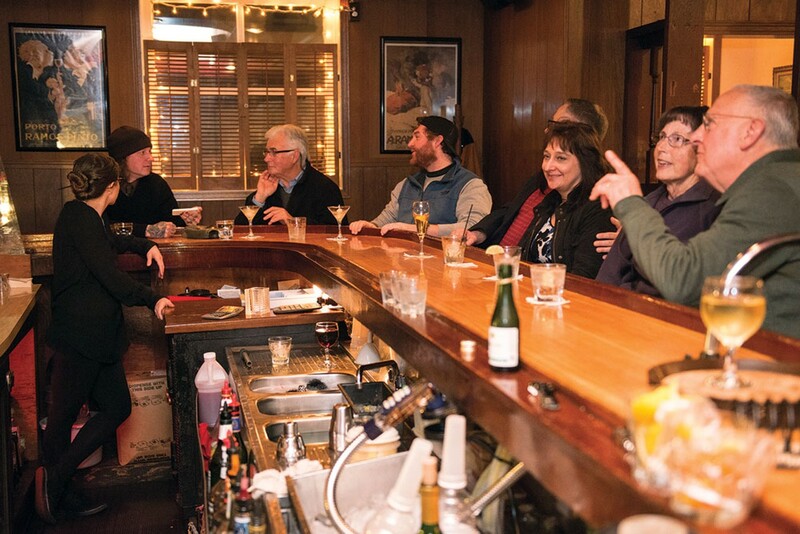 It's the last night at Roy's Club, first a cigar shop and speakeasy, then a tavern and restaurant, all presided over by the Fanucchi family since 1919. Tonight, people have come for a last meal, to pay their respects, to shake the broad hand of 96-year-old Evo Fanucchi and maybe hear one more story at the bar where he always held court on Friday afternoons, and to toast days that will not come again. Doug Durham, who comes for lunch every Friday with a roster of a dozen old friends, begins the night at the bar. The group is at a loss as to where they'll go now. "I'm family here," he says. The closing of Roy's marks the end of an era, or more accurately, several eras strung together over generations and continents. This old Eureka story begins, like all but native histories in Humboldt, with immigrants. Once past the small door marked "dining room," you're greeted by a gallery of black-and-white photos screwed into the wood paneling. The first from the left is a family portrait taken in 1930. In the center is Teresa Fanucchi, the matriarch, with dark, wavy hair, deep set eyes and an aquiline nose, her mouth set in a soft line. The two sons — 16-year-old Roy in his necktie and sweater with a mound of hair swept back off his forehead and 10-year-old Evo in his striped suit and polished shoes — favor their mother. They have the same straight brow, the same mouth. But 8-year-old Ida, perched with one dangling Mary Jane crossed over the other and a grin pulling to one side, looks like their father. Behind her, the dark-suited Angelo Fanucchi's eyes are on the camera, but his face is turned, his right eyebrow is arched, sharp as the part in his hair. His full lips are open as if he is about to speak. In the first years of the 1900s, amid the swell of millions of Italians escaping poverty, Angelo Fanucchi sailed to the East Coast of the U.S. to earn money for his family back home in Tassignano, a small town near the walled city of Lucca in the Tuscany region. According to a talk Evo Fanucchi gave to the Humboldt Historical Society a few weeks ago, Angelo worked for a couple of years and learned some English before returning to serve in the Italian Swiss Guard for two years. Then he came back, working his way across the country to San Francisco. He heard there was good money in logging up north and in 1906, just before the massive earthquake hit San Francisco, he boarded a ship to Eureka and went to work at Camp Essex in present-day Fieldbrook. Teresa Ceccorelli, meanwhile, had also come to America from Tassignano, having found a sponsor family in San Francisco. 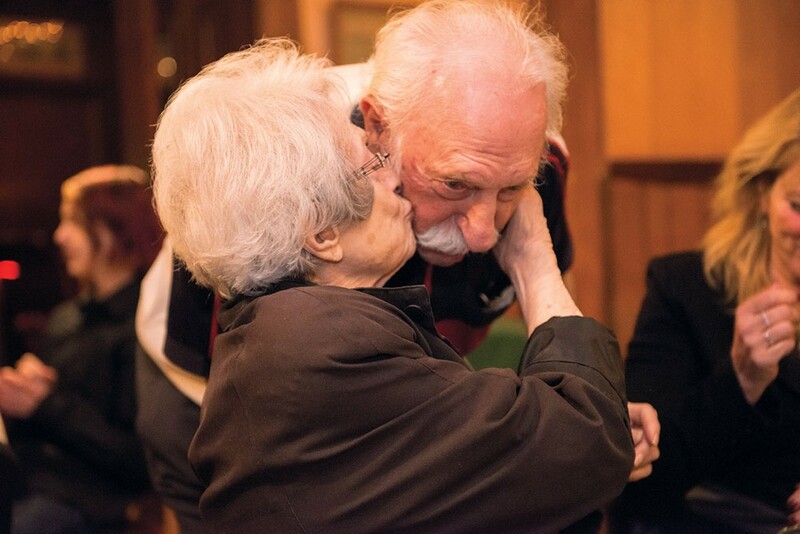 When she heard the young man she'd known back home was in Humboldt, she was eager to see him and sailed to Eureka, checking into the Buon Gusto Hotel — now the Eagle House Victorian Inn — where Angelo came to meet her. 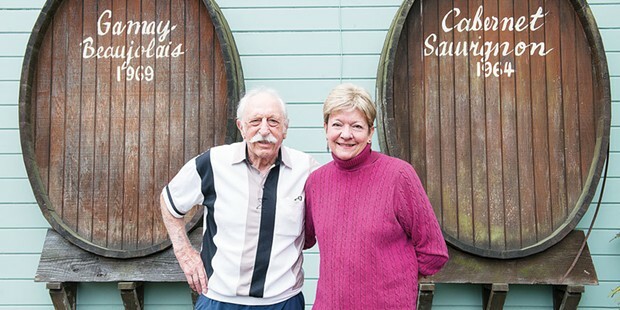 The two married in 1913 and Roy was born a year later at Camp Essex. 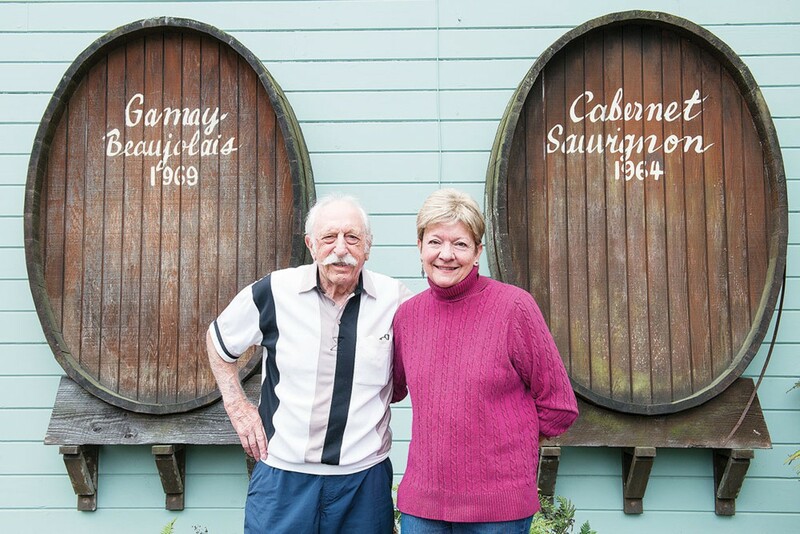 A few years later, the family moved to Arcata as Angelo got out of the logging business and into another thriving Humboldt industry with his brother-in-law: bootlegging. In 1919, on the eve of Prohibition, the Fanucchis bought a sausage factory at 218 D St. in Eureka and set up a cigar shop on one side and a speakeasy on the other. There is some commotion at the door as Evo's sister Ida Newell makes her way in with her walker, stopping to hug waitresses and old friends. Ida, 94, wears a black and white scarf at her neck and her short pearl-gray hair is airily coifed with a forward curl above each ear. "I was here at the beginning," she says, "I was gonna be here for the end." When Ida was 2, the family moved right upstairs from the business, where Evo and his wife Catherine still have their apartment. That was 1924, when the speakeasy was in full swing and Old Town was crowded with brothels serving rough and tumble loggers and fishermen. "Upstairs they had what we called the plant," she explains. This was a pipe with a tap that dispensed water if you turned the knob one way and whiskey if you turned it the other way — perfect for fooling the authorities should a copper decide to check the spigot. Ida smiles and waves a hand. "We used to play with it." Of course, "whiskey" is a loose term here. Her father, she says, "would go to San Francisco to buy the (grain) alcohol. He'd come back here and cut it and color it and they would test it," for strength, not taste. On one of those runs, he dropped off Evo, Ida and Teresa in Calistoga while he picked up 5-gallon drums of hooch in his truck. On the way back, "My father made a bed over the top," and the children lay down for the ride. When a highway patrolman stopped them for a busted tail light, "My father turned around," she says, jabbing her finger in the air, "and told us, 'Don't you open your eyes — you two stay asleep.'" The patrolman looked at the siblings feigning sleep and let them be rather than search the truck. Upon seeing Angelo's Moose Lodge pin, he mentioned he, too, was a member and let the family go with instructions to fix that light at the next gas station. Still, Ida says she never felt scared, even when the dry squad busted her father. "My father got picked up that one time," she says. He spent a week or two in jail after the joint was raided, though it seemed more like a formality than a punishment. "My mother would cook spaghetti dinner on the weekend for the whole jail," where the cell doors weren't even locked. "Evo and I played in there." As for the rough neighborhood, she and Evo both recall happy times surrounded by Italian families that lived nearby, playing with the other kids on Second Street. By 6 p.m., waitresses are gently turning away walk-ins and the bar is out of cherries. It's a recent development for a place bartender Sarah Switzer says has been "pretty dead" with only a few tables full on weeknights for a couple of years. "So if your business is suffering, say that you're going out of business," she quips. The kitchen is slammed; all the pans are off their hooks and a young cook is moving colanders of pasta in and out of an enormous pot. Cartoonish orange flames shoot up as chef Willy Karanopoulos shakes a pan of zucchini over the stove. A waitress swerves out of the kitchen with salmon ravioli in one hand and spaghetti with red sauce in the other. Catherine Fanucchi, Evo's wife, was rushing to make extra pasta yesterday, knowing the place would be packed for its farewell. Evo, who still has a thick head of hair, now white, and sharp eyes beneath bushy eyebrows, walks in with Catherine, who smiles and nods at everyone, keeping a hand on his back as they move from table to table, shaking hands and hugging friends, family and former employees. This, at long last, is their retirement. Evo has been working one job or another since he was a kid. At the age of 14 or 15, he'd pick up stacks of freshly printed newspapers at midnight and deliver them to the bars and brothels that were open late. At establishments like the Ruby Rooms, the Denver Rooms and the Mission Rooms, he'd climb the stairs toward the second floor — sometimes triggering a bell under a wood step — and either one of the working girls or the madam would meet him. "I was always hoping it was one of the girls that had a good night," he told the historical society, "because I'd give her a paper and she'd give me 25 cents. When the madam'd come, I used to get a dime." The bootleggers, speakeasies, crooked cops and brothels seem quaint and even glamorous now, but there were genuinely dangerous characters moving around and through Old Town. There are tales of an iceman who was found shot in the alley by the Shanty and brawls in the streets. When Angelo's business partner was shot in the saloon, he was briefly accused but had a solid alibi. When Evo was 12 and Ida was 10, they went to the lot by the Shanty to play but found the gate locked and a handful of men playing baseball inside. The kids shimmied through the gate and joined in for a spell. Only years later did Evo learn that among those men were George Francis Barnes, the gangster and kidnapper better known as "Machine Gun Kelly," and Lester Joseph Gillis, aka "Baby Face Nelson," a member of John Dillinger's gang with bank robberies and dead FBI agents on his resume. The rumor was they'd come to lay low for a while in remote Eureka when things got "hot" back in the Midwest. After Prohibition ended, Roy Fanucchi, an American citizen, secured a liquor license and the joint went legit. Which isn't to say things got boring. According to Ida, Billie Holiday's handlers would sometimes "send her up here to R&R, to dry out." Mind you, coming to Humboldt "to dry out" sounds like a flawed plan at best and this was more likely about keeping the legendary singer away from drugs. "She would sing at the Monte Carlo," Ida says, who supposes "she had a crush on Roy" since she used to go back to the kitchen to see him. Evo had his adventures, too, doing a little work for the Tom Lazio Fish Co. Inc. In the 1940s, shark liver oil had grown into a booming local industry. Prized for its potent vitamin A and D, and its use as a non-freezing lubricant for airplane instruments, the oil went for $23 a pound during what Lawrence Lazio calls the "gray gold rush." When Evo was a young guy and the truckloads of shark liver (oil) were being shipped to San Francisco, Evo rode shotgun to protect the deliveries. With an actual shotgun. Lazio says nobody tried to rob the shipments, but the company wasn't taking any chances. "There could be $100,000 to $150,000 worth of shark livers in a shipment. Which would have been like a million dollars," he says. When the Japanese bombed Pearl Harbor and the U.S. entered World War II, things changed for the family again. While they weren't completely uprooted or imprisoned like Japanese Americans, Angelo and Teresa still weren't citizens and as "enemy aliens" had to follow restrictions. 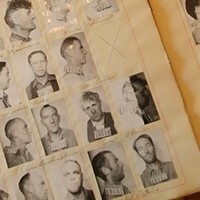 Ida remembers her parents weren't allowed within four blocks of Humboldt Bay for fear they might spy or commit sabotage, despite their American-born son Roy serving in the U.S. Coast Guard. Ida, a citizen, could come and go from the business, but her parents moved to a house on Fifth Street and had to trust the business to her and others for about six months, a period that may have been shortened due to Evo serving in the Navy in the Pacific. Waitress Kathleen Cross walks briskly to the bar with a drink order. "Martini, just one olive; I don't think she wants to displace the alcohol." A career waitress, she started bussing tables at Roy's when she was 19 and has been waiting tables there for more than 30 years. "I still drive the first car I ever got. I'm still married to my husband of over 35 years," she says. That's long enough for a spot in the painting in the dining room, a dinner table with Evo, Catherine, Sophia Loren and Marlon Brando, among others. She is that disappearing breed: the career waitress, moving with unhurried efficiency from kitchen to bar to table, making it look easy, not a hair coming loose from her pinned chignon. She'll miss coming to work every day even more than the cannelloni. 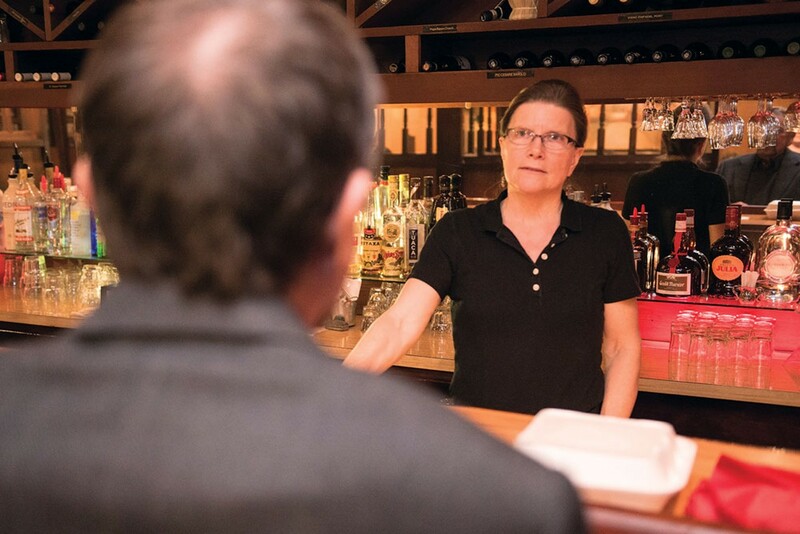 Between the regulars she stops to chat with and the staff, "It becomes your social life," she says with a smile and a shrug at Switzer. "You become really close." With a quick breath, she refocuses and gets back to work, smiling brightly and greeting another party walking in. Cross is as much a draw for some of the customers as the food — they request her at their tables and send her Christmas cards from afar. Someone leaves her a bottle of Champagne at the bar. All night, customers coming and going hug her and say they'll miss her. After tonight, she says, "I'm gonna take a little time off. Take it day by day." Evo comes back to the bar and tells Switzer not to bother restocking the stirrers. "After tonight, it's the end of everything," he says. He started tending bar here in 1941 when he was 21, working the front while his brother ran the kitchen until his death in 1991. 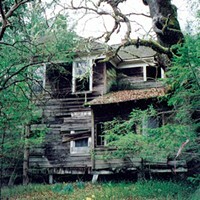 It was after Roy's death that he and Catherine bought full ownership of the place. He takes halting steps to the wall of photos and traces his fingers over an image of his father behind the bar in a broad striped tie, then another of himself at the bar in a nearly identical tie, noting the changes made over the years. He runs his hand over his push-broom mustache and points out the first car he ever bought (a Chevrolet that took him two years to buy, as a matter of fact), a picture of him in Navy whites with his 105th Sea Bees patch, his sister, his late brother, his mother laughing, other faces long since gone. A man stops to say hello. Shaking his hand, Evo squints and asks, "Who am I talking to?" There's a brief story about the man's father and Evo makes the connection, clasping the man's shoulder and talking for another minute or two. Ida sighs lightly. "This is the type of place that will never be again. They've outlived themselves, I suppose. The places now are colder," she says. "They're just not like this place." A trio of priests in a booth by the kitchen agrees. 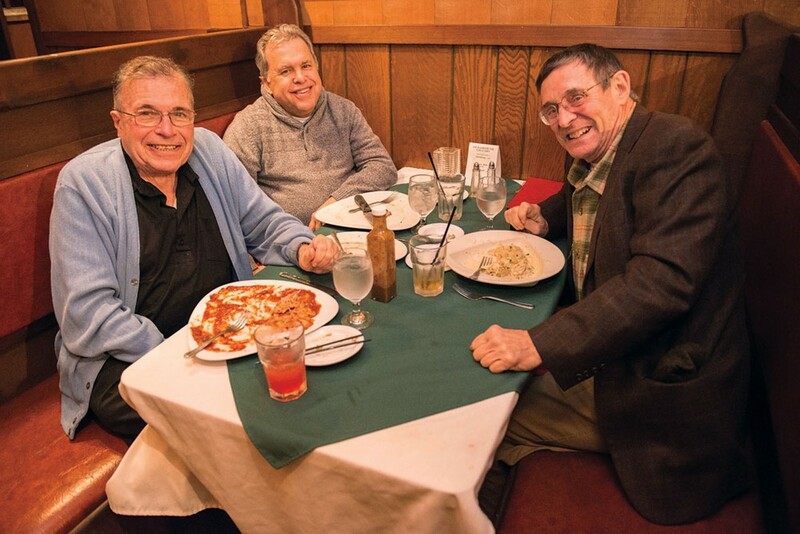 Father Jerry Brady, a fan of the ravioli, has been coming to the restaurant a couple of times a month since 1962. Roy's was the first place he brought Father Thomas Diaz, pastor of St. Bernard Church, seated beside him. Across from him is Father Mike Cloney, who says he was "born and raised on minestrone soup." Cloney laments that "none of the families are left," adding, "the Italian families that served the community are all retired." When asked what he'll do from now on, he doesn't hesitate: "Fast." By 7:30 p.m., Evo comes back from his sister's table. "I'm really going now. My wife's got a bottle of Champagne and I better make sure she doesn't drink it all," he says, raising his brows. An hour and a half later, the last meals have been plated and the burners on the stove are out. The waitresses are boxing leftovers for guests. Switzer's boyfriend Kris Cunningham, a tattoo artist at Sailor's Grave, is here for the last drink before the bar closes, a row of dusty novelty decanters — a spotted elephant, court ladies and a fiddler among them — watching overhead. Nobody knows what will happen to all the liquor. Cunningham orders a shot of Jameson just before the lights dim and toasts with Journal photographer Mark McKenna. It's just a few friendly stragglers now, stretching out the evening as the lights go out room by room. Cross calls for a screwdriver. "I'm taking a picture off the wall," she says. It's a photo of the old crew from 20 years ago in the kitchen, with her and Evo in the center. She has a hand on his shoulder and another on his arm; to look at them you'd think they were father and daughter. "Catherine already knows I'm taking it," she reassures everyone. "It's the only thing I'm taking."